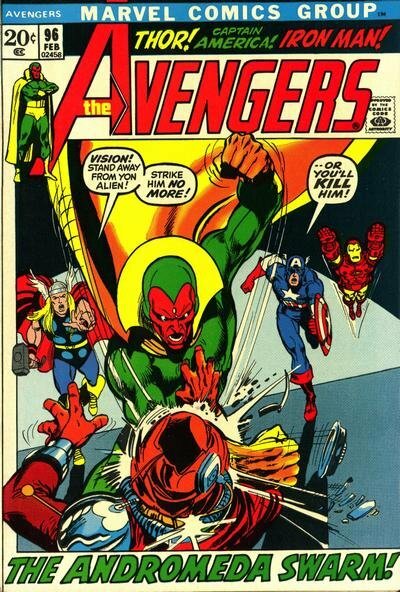 Click Here To See Avengers #96 Comic Book! Check out this STUNNING 1971 prime era Neal Adams Avengers #96 page, featuring an awesome half SPLASH with 3 KEY members of the Avengers, from perhaps the most famous comic book story of the early 1970's, "The Kree-Skrull War". GREAT images of Iron Man, Captain America, and Thor holding his hammer at the bottom, with Captain Marvel [Mar-Vell] blasting a ray weapon, as Kalxor and a huge image of Kree Intelligence Supreme explain the events going on! Neal Adams only drew four issues of Avengers (#93-#96), so any page is extremely hard to come by and this one from #96 is a SURE keeper! Adams and writer Roy Thomas made history with the "Kree-Skrull War" issues, upping the cosmic ante as they combined multiple Kirby/Lee concepts into one epic narrative thread, establishing the concept of "Cosmic Marvel" and setting the bar for future epic stories like "Secret Wars" and "Infinity Gauntlet". 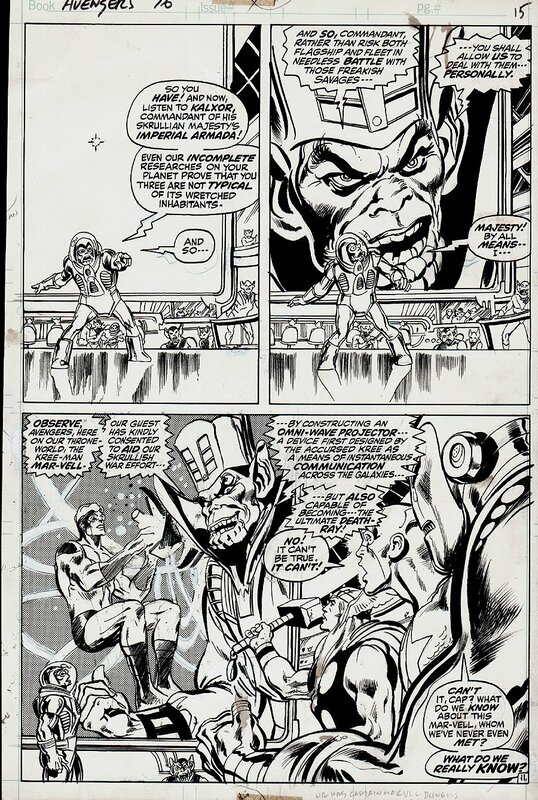 EARLY BRONZE AGE Neal Adams AVENGERS pages are some of the most sought after art in our hobby, so don't miss out on a great opportunity here to own a SWEET 1971 Avengers action page by this great artist! ALL art on our website (including this one) are able to be purchased with VERY fair time payments, and trades are always considered towards "ANY" art on our website! Just send us an email to mikeburkey@aol.com and we can try to work something out.